Many companies like Uber, Waymo – google’s self-driving car company, and GM, are focusing on implementing driverless cars on the road. This new feature surely brings many benefits to our society like fewer labor costs, better decision making than that of human, and less of automation. However, implementing the technology that is not ready is too risky. After Uber’s fatal crash that killed a pedestrian in Tempe, Arizona, many companies backed a little about this technology and focused mainly on safety. Now Uber is back on the road testing its improved autonomous car. However, compared to accidents occurred from a human being, there have been less AI related accidents with less severity. As technology evolves, the accident rate from autonomous vehicles will reduce. As the 5G technology is implemented into our daily life by March 2019, these accidents will disappear. Cars on the road require immediate decision makings in order to minimize accidents, and there should not be a lot of latency in wireless connection. 5G technology will enable cars to have latency between 1 to 2 milliseconds, and this will enable cars to make a right decision very quickly unlike the previous internet could provide. Would you be able to be on one of the autonomous cars if implemented now? In the future? If your answer is different between for now and in the future, why is that so? I definitely think that autonomous vehicles are the future and they’re here to stay. Self driving cars have always been a dream to people and the benefits which we will receive from them will be unmatched. From a business perspective this new technology is flipping the whole auto industry on its head because car companies are moving more and more from being car companies to being computers on wheels companies. Much of the industry will have to completely shift their thinking and transform their business model to meet the needs of the future. I personally would love to experience self driving cars not only for the ease of not having to focus on driving, but also for the benefits they provide in safety. 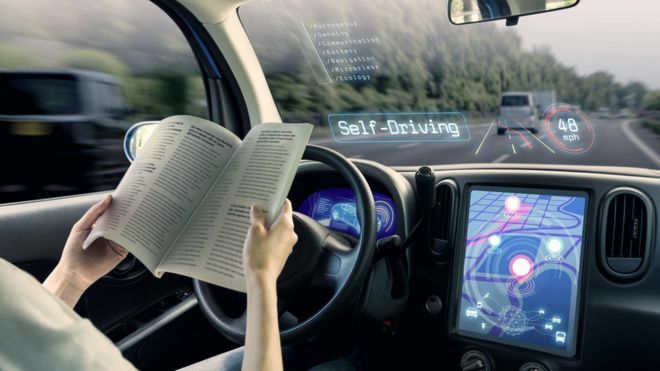 Other factors from self driving cars that would benefit society as a whole are the fact that they could immensely reduce traffic congestion, which would relieve stress in our everyday lives and also reduce gas emissions because there would be less cars on the road. If I could afford one right now. I think that autonomous cars will be beneficial if implemented right. I am not sure if we’re ready for autonomous cars right now though. There are so many issues with these types of cars as of now. Beside an issue relate to accidents, there are also problems related to autonomous cars. We could see potential problems with more auto thieves. Some people will always try to find a way to hack into these cars and can steal valuable information. So, Tesla or any car manufacturers need to make sure that these cars are equipped with multiple layers of securities. In addition, many autonomous cars put pedestrians first meaning that the car will come to a stop if there’s a pedestrian stand in front of it. It is good until we’re in a situation that we need to escape away from thieves. In addition, pedestrians can become more aggressive when trying to cross the road. They wouldn’t care if drivers are going hit them since they know these cars will definitely come to a stop. Imagine how that would be when everyone drives autonomous cars and we’re on Broad St, pedestrians will just cross the street whenever they want. If these companies can find a solution to this problem, I think it would be great. For me, I would love to own an autonomous car in the future. I’m sure in ten years, one of the car companies will solve issues that I mentioned earlier as well as other issues. I think autonomous vehicles are definitely going to be the future of the road but I think we are much further away from this than people might think. Having our roadways filled with completely autonomous vehicles would be very beneficial to society, creating much less frustration with traffic and human driving errors, but for this to happen these systems would need to be flawless. As the industry is beginning to shift towards autonomous vehicles, companies are investing in R&D in their AI programs. This is good and necessary to ensure the quality of these new cars but there is too much risk for this technology to be implemented immediately, or in the near future in my opinion. There have already been problems with these technology and based on the history of IT projects, I believe there are many more to come before we see truly autonomous vehicles on the road. Personally, I would be interesting in trying some of the autonomous features that some new models offer but as for a fully autonomous vehicle, I would want to wait until the technology haven proven itself to be flawless before letting the computer completely take the wheel.